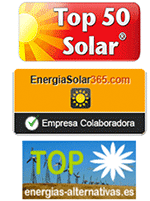 The history of solar energy, especially photovoltaics, has been very peculiar in Spain. It all started in 2004 when a Royal Decree initiated the connection of small installations to the network. Attracted by a reasonable return on investment, small installations began to connect to the Spanish grid. The system was like that of many countries today (few at the time) charge a fee per kWh fed into the grid. He arrived in May 2007 and was issued a Royal Decree that would give wings to a Spanish photovoltaic sector. Of the 400 MW that the government thought it would be installed until 2010 was reached 3,400 MW in 2008. The yield was attractive and in good times many savers declined to its investment in the "energy of the future". Overinstall came with power quotas for 2009-2011, although profitability remained Similarly, the limitation of power (400 MW annually) stopped short the sector. Many businesses closed and minimal industry remained low. They arrived in 2010, began government cuts to the facilities already in place, new taxes and limits on production which lowered the profitability of the installations. The allocation of new capacity was paralyzed. Thus you can not connect new power premium. And now, what is the situation? As the industry still wants to perform installations. The equivalent of 40 nuclear power plants is required for connection, the conventional installations would electricity market, ie "no premium" to compete directly with other energies equal. That power, a portion (close to 10% l) has deposited guarantees for connection, which are projects that are to start developing. While on the other hand it seems that the government's plan is to continue with cuts to the photovoltaic that would unfeasible its financing, producing numerous defaults (which is already happening with the first steps in some cases). But the government already has a plan for when that happens, and the left is that the bad bank, like other toxic assets. What is your goal? Are they could be then sell power at a low price? This would be a horrendous waste, a theft more to add to the list that we are witnessing lately. The truth is that the plan would be perfect. Photovoltaic solar energy you had left the coexistence channels. What does that mean you can generate electricity without electric company? They were taking away the business. And we know what friends are politicians in power. To give an optimistic this version, I must say that: Photovoltaic solar energy has a high democratic component, because anyone can generate electricity on a small scale, and that can not change anyone. Nobody can get into our house and tell us we have a connected photovoltaic module and to pay a 6% tax on electricity, because we do not use the public network. No one can take away the right to produce our own energy.